268 x 200 mm. – 20 leaves. With 38 woodcuts, frames and some details touched in the rubricator’s red and pale yellow. Third edition. Full title: Des pfaffen geschicht und histori vom kalenberg. Auch von dem aller schonsten ritter Alexander unnd von seiner schonen frauwe. One of the outstanding works of German popular literature of the 15th century, this text relays the amusing antics of the Priest of Kalenberg and the pranks and clever tricks he played on the ducal court, fellow clerics, and his peasant parishioners. The protagonist of these tales is based on a real historical figure who is currently identified as Gundaker von Thernberg. Apparently an eccentric and headstrong personality, many droll stories linked to this priest constituted an oral tradition in the 14th and 15th centuries. 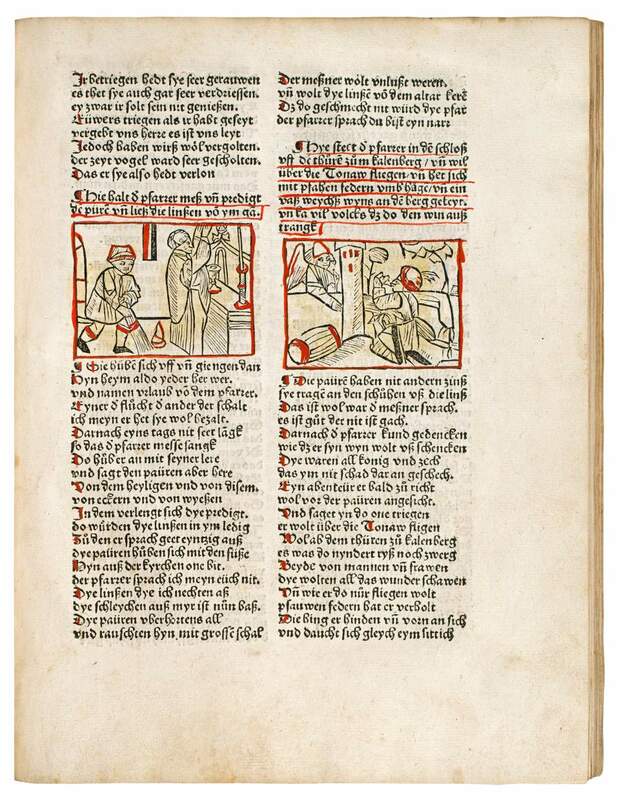 Philipp Frankfurter (c. 1450-1511), a poet active in Vienna, gathered these circulating tales and composed them in a collection of lively rhymes in German vernacular. All three incunabular editions are extraordinarily scarce.